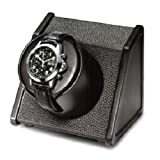 The Orbita Sparta 1 Open Lithium Watchwinder Black & Brown Foux Leather budget-priced winder is compact and free-standing. Choose either finish, stylish brown or jet-black, fully grained faux leather. Orbita sparta 1 Open Lithim Watchwinder is fitted with rubber feet to prevent sliding or marring polished surfaces. Mounting cup and cushion are easily removed to facilitate loading and unloading, and to provide access to the mode-changing switch. Factory-fitted with 2 ORBITA Lithium D cell batteries, which provide a minimum of 5 years guaranteed operating life at the normal 10-minute winding cycle. Even longer life may be accomplished using the 15-minute mode, depending upon the watch's winding characteristics.